The Samsung CF390 boasts the much coveted title of being the world’s most curved screen, so if you don’t like curved screens – look away now! The C27F390 is part of a range that promises maximum immersion whilst being easy on your eyes. The monitor is spectacularly slim, just 11.9mm, which as Samsung are keen to point out is the width of a ball point pen! Curved monitors are right on trend at the moment with a number of manufactures adding curvy screens to their repertoire. The idea is that the corners of the screen are brought a little closer to your eye line allowing you to focus more easily thanks to the view hugging your natural line of vision in a way a flat screen never will. At least that’s the theory, I’ve yet to test one in the flesh and we’d love to hear your thoughts in the comments below. The monitor is gamer friendly, not only thanks to it’s gorgeous curves but all because it support AMD’s FreeSync technology, paving the way for stutter free smooth gameplay. 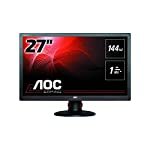 It’s a 27″ HD screen and features a standard 60Hz refresh rate. 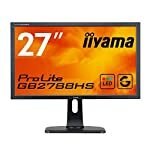 If you are looking for high res or 144Hz refresh then you won’t find it here unfortunately. It is worth noting that there is a smaller version of this model, the C24F390 and if you are looking to spend a little more, then you might want to investigate the C27F591 too. It’s not especially clear what the differences is between the C27F390 vs C27F591 but the latter has speakers, greater colour range and costs more. If you have more information on what makes them different please comment below. The overall design is neat enough, slim bezels, rounded base and a typical black glossy finish. Round the back connectivity seems limited with just one HDMI and VGA port available, not so good if you want to hook up more than your PC to this screen. There is also a headphone socket but no USB ports. Overall it presents a stylish look that I’d be proud to display in my home office. The Samsung has a 1,800mm curvature which means a deeper more natural curve than competitors right now. Some critics have claimed that some monitors are not curved enough to make any real impact so Samsung are going a step further than most to give you a better picture. It comes with a simple yet sturdy stand, given the curved nature of the screen you’ll need to position it directly in front of you anyway, it wouldn’t make sense to include the ability to pivot 90 degrees! There are no speakers included on this model but there are headphone sockets which are helpful for plugging in your own headphones or desk based speaker setup. You’ll probably get better results that way anyway. The C27F390 is not branded as a gaming monitor, but that doesn’t mean it can’t keep up with your fast paced action games. It has a couple of things going for it. For a start it has a VA panel with a non too shabby 4ms response time. This means you’ll get clear images during high action sequences, no nasty ghosting. The VA panel differs from the more common TN and IPS screens in that they provide much darker blacks but also they’re known for providing punchy accurate colours. Samsung are known for their high quality displays and owners report back vibrant out of the box performance. Professional objective tests also return good results with reviewers citing the near perfect colour reproduction and uniform back lighting. On the down side, viewing angles are slightly inferior but should not present a problem when the screen is viewed head on. This model also includes FreeSync, now this is a technology designed with gamers in mind so this is good news. FreeSync aims to eliminate tearing thus giving you a smooth stable image. You’ll need a compatible AMD graphics card to make use of this feature but the monitor will still work with an older card if you plan to upgrade at a later date. I’ve read different opinions on whether the curve is a good thing for gamers but looking through owner feedback the general consensus seems to be that it does improve the level of immersion. Let us know your experiences in the comments below. 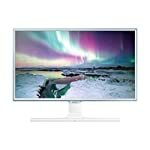 We give the Samsung C27F390 a 4.5 out of 5 rating. Want to know what existing owners of the monitor think? You can read real user reviews here. 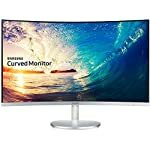 Should I buy the Samsung C27F390? A beautiful well proportioned screen with slim lines, gorgeous curves and FreeSync support to help gamers get superior animation. However it has a maximum resolution of 1080p and refresh rate of 60Hz. The VA panel gives great image quality and provides a good all round balance for work and play. If you are having some doubts about this purchase then why not read some real owner reviews and see what other buyers think. Official Site : Get the specs, manual, downloads and more. Press release : More info from Samsung. Welcome to the Samsung C27F390 FAQ. This section attempts to answer common questions you may have, please get in touch if you have any more queries or if you think our answers need updating. Can I use my Nvidia card with the C27F390? Yes, you can use. But, Nvidia have not adopted the VESA Adaptive-Sync standard into their G-Sync system so you won’t be able to use the FreeSync capabilities. That doesn’t necessarily mean you should discount it, a G-Sync model would cost more and if your card outputs a constant 60 frames per second then you won’t really need adaptive sync tech. What is a VA panel? VA (Vertical Alignment) panels offer a solid medium between TN and IPS panel types. VA was created to combine the advantages of IPS and TN panels, but still incorporates some compromise. VA panels can offer faster refresh rates but slower response times but IPS still wins on viewing angles. No technology is perfect it seems! Can I use it on my Mac? Other owners have reported that it will work with a suitable thunderbolt port adaptor to HDMI lead. As I am not a Mac owner I cannot confirm. 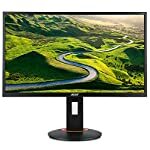 how could you review a monitor you have not used? this is a ridiculous website. Hi nane, fair point, the site started as a way for me to document my own research, I read professional reviews, user opinions, spoke to people, watched videos and wrote up my opinion on the monitors in the genuine hope that it might be useful to others. I think you’ll find this model does not have integrated speakers!! Thank you. Yes, you are correct. I think I was confused with the C27F591 which does have 2x5W speakers. I have updated the spec database and made this clear in the monitor description. Feed back always appreciated!